Key performance indicators (KPIs) form an important part of the information required to determine and explain how a company will progress to meet its business and marketing goals. KPIs help organizations understand if the company is headed in the right direction—and if not, where it needs to divert its attention. No matter what it measures, a KPI's goal is to improve organizational health. Anyone working in marketing needs to understand exactly what constitutes a KPI. A key performance indicator is a quantifiable measure a company uses to determine how well it's meeting its operational and strategic goals. Different businesses have different KPIs depending on their individual performance criteria or priorities. That said, the indicators usually follow industry-wide standards. Quantitative. KPIs can be presented in the form of numbers. Practical. KPIs integrate well with existing company processes. Actionable. KPIs can be put into practical application to effect the desired change. To be effective, a key performance indicator must be based on legitimate data and must provide context that echoes business objectives. KPIs must also be defined in such a way that external factors, beyond the control of a company, cannot interfere with them. Another key issue is that KPIs should have a specific time frame that is divided into key checkpoints for accuracy. An organization’s KPI is not the same as its goal. For example, a school may set a goal that all of its students pass a particular course. However, instead of using the students' passing grade records to chart the goal, the school uses the students' failure rate as a KPI to determine its position. Another example is a business that chooses to use the percentage of income it receives from its returning customers as its KPI. 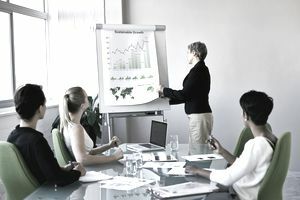 When choosing key performance indicators, a company should start by considering the factors the leadership team uses in managing the organization. Next, consider and identify whether these factors help in assessing the company’s progress against its stated strategies. Finally, you need to make sure that the KPIs selected are clear enough so that the people who read the reports understand them. This allows the people inside and outside the company to make similar assessments. Although industry standards have significance, companies do not necessarily have to choose KPIs similar to those of their competitors. More important is knowing how relevant the indicators are to your business or the unit or division you're assessing. Also, a company doesn't need a specific number of KPIs. However, in general, the number usually ranges from four to 10 for most businesses. Whatever number you decide upon, just make sure the KPIs are crucial to business' success. Remember, if everything is important, then nothing is important; so be selective. A subtle difference exists between key performance indicators and marketing metrics. Remember that all KPIs are marketing metrics but not all marketing metrics are KPIs. Before doing anything else, a business must first determine which marketing metrics qualify as their key performance indicators. While indicators do not necessarily have to be financial, whatever indicators are selected, these indicators play an important role in steering the various marketing vehicles for management. Consider this perspective; a metric is a measurement, but a KPI adds context. For example, a metric can be the number of customers, number of sales, or total revenue. Metrics are important, but until you start making comparisons they are simply numbers. Typically, a metric is a combination of two or more measurements. Metrics can help with financial forecasting, benchmarking, and designating a value of good or bad—but metrics stop there. Metrics morph into KPIs when you put them in the context of a particular organization or industry. A KPI adds substance and weight to the detail. This is why ratios and percentages are considered good KPIs—they show in a broader context whether a company is doing well, not doing well, and where.